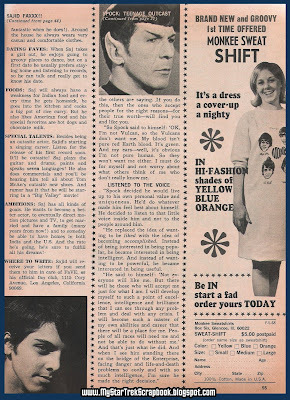 My Star Trek Scrapbook: 1968 Article "Spock: Teenage Outcast"
1968 Article "Spock: Teenage Outcast"
Hello all, Frederick beaming back in for a quick post! I hope to be able to start posting again (more often) so check back in soon for more! 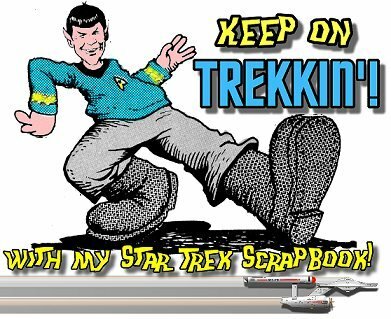 I have always kept to my own personal collection for this blog, but when reader Bluejay Young, a Trekker since November '67, emailed me these scans, I knew I would make an exception. His journey into fandom began before mine, as I didn't truly discover the show til about 72, when I became a Trekker myself. This article titled "Spock: Teenage Outcast" came from the May 1968 edition of the teen mag FAVE. The article is interesting in that it was Nimoy's response to a fan letter from a mixed-race girl that was struggling with fitting in. 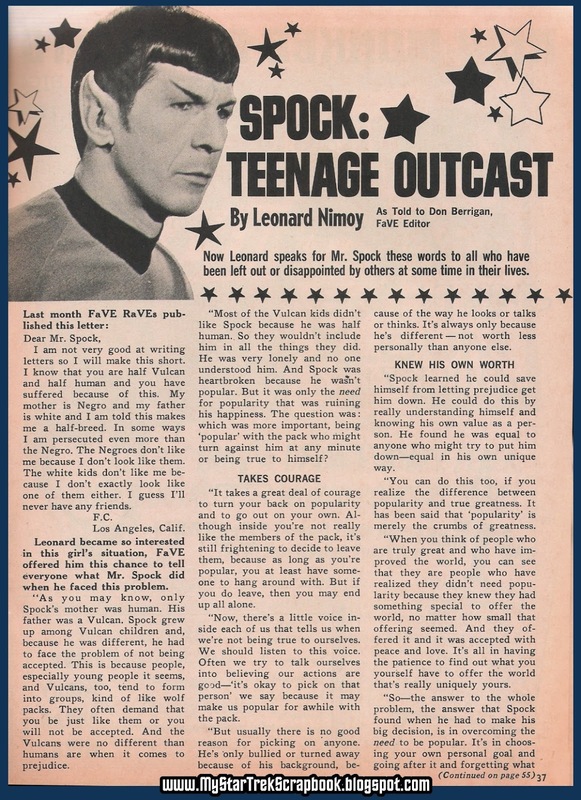 There is real concern and thoughtfulness in his response, and it was both interesting and compassionate; as he framed his advice in the form of telling how young Spock might have dealt with the stresses of feeling excluded from the group and being bullied. He used the fan's interest in the character, and how they related to the half-human, half-Vulcan Spock, to share some down-to-earth encouragement. 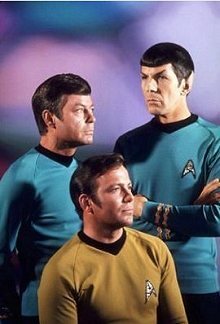 The thoughts he attributed to Spock also demonstrate his ongoing interest in the development of the character, and prefigure the scenes of Spock's difficult youth and struggle with bullies and prejudice in the animated series episode "Yesteryear" and the '09 Star Trek film. UPDATE: Thanks to BUZZFEED for linking to this blog entry and making some great captioned images of Spock and quotes from the article! UPDATE 2: The hits just keep on coming! This page has gone viral, as the Huffington Post site also carried the story! Update 3: On February 27, 2015 we lost the legend that was Leonard Nimoy. This page saw over 12,000 hits over the weekend, as people found the article from various sources that republished it online. 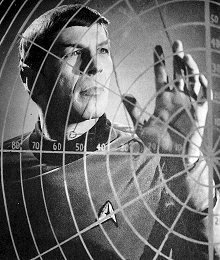 I hope that the original article serves as a memorial to the compassion and thoughtfulness of Mr. Nimoy as people continue to enjoy the archive of it here. Bonus: Speaking of inter-racial relationships; below is a fantasy moment made real; Kirk and Uhura making out! It looks like a behind-the-scenes moment from "The Wrath Of Khan," but I'm not sure. 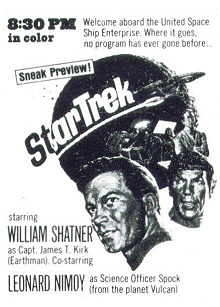 One thing that is clear, however, is that Nichelle and Shatner were close enough to kiss on the lips at one time, and there seemed to be none of the antipathy toward Bill that showed its head among the secondary cast later on. Replaying the moment from "Plato's Stepchidren" was a favorite game of theirs. 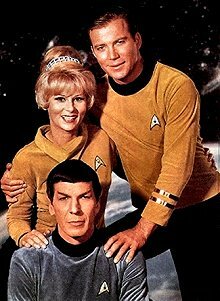 Shatner's gray temples and Uhura's hairstyle put it more likely at around THE UNDISCOVERED COUNTRY to me, which might explain the celebratory glasses of champagne as well. Very cool. Thanks for sharing it. The photo of Shatner and Nichelle Nichols is pretty interesting. That's a heck of a kiss! What was always fascinating about Nimoy was his interest in Spock, even when he grew conflicted about it. Everyone else seemed concerned only about their screen time. Glad that meant he was also concerned about helping people out based on his insights. Frederick, you're back! I had feared that you'd succumbed to Rigellian Fever or had been sent to the zienite mines on Ardana. Glad to see that you're back sharing from your great collection! Rob, thanks for the comment, glad you came back to visit! I will try to not go so long between postings if I can. What happened to the girl? Anyone know? I don't know, but it would be cool to hear from her and find out what effect th answer had on her way back then! Thanks for reposting it! I am like you, I wonder if the girl read it, and what effect it had on her. Wouldn't it be neat if all this coverage now caused her to step forward and talk about it? Hey Frederick, thanks for responding. I'm glad Huffpost tipped me off to your blog! I will be a loyal reader from now on. Look forward to seeing more comments as you delve through the blog archives! I read about your blog through Huffpost Good News on Facebook. I was touched by Leonard Nimoy's response to the interracial girl. He gave her good advice and I too wonder what effect it had on her life! I'd like to think it inspired her to rise above the prejudice directed at her. Leonard Nimoy is a classy man. Love your blog! Thanks for posting a comment, glad you are enjoying the blog. A lot of people have discovered it through the Huffpost site and others. Yesterday I had over 1,700 visitors! Thank you very much for sharing this. I am at a time in my life where I desperately needed to see this. Again, thank you. If I ever meet Mr. Nimoy, I will thank him myself (probably by bawling like a baby, lol). This article is all the more poignant now that Mr. Nimoy has left us. God bless him. It's AWESOME that your blog post has gone viral! What an important historical gem of tolerance, courage, & understanding. I just shared it with my Librarian & Educator PLN - what a great story to also share with my middle schoolers. May I have your permission to mirror your scans on our blog? With full attribution and watermark, of course! Slowly I'm remembering this event; and, thinking this particular incident contributed to making Leonard Nimoy one of my generation's favorite beings. This story is one of "beyond this world" proportions. Certainly, if a being is half-human and half-Vulcan, he/she/it could easily help an earthly teenager with social and bi-racial issues. A nice find & glad it is getting wider release. 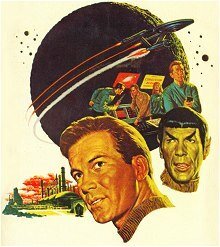 Welcome to my Star Trek scrapbook! 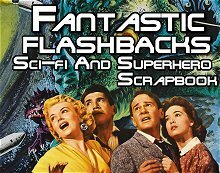 Since around 1971, when I was first bitten by the Star Trek bug, I have been collecting all sorts of items for my scrapbooks; photos, articles, ads, and more. 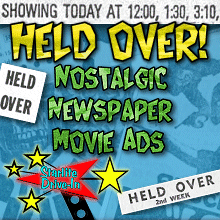 I hope you join me often on this fun and nostalgic look back, as I share them with you, one at a time. 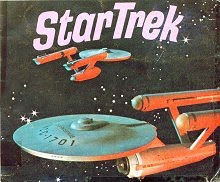 It's a "phaser blast from the past!" 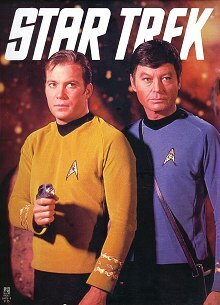 This Site Named Best New Fan Site for 2008 by TrekMovie.com! Click to keep up with new posts! Click on any images to enlarge! "I'm getting something about a big brother V'Ger which we will someday have to deal with." Yes, I know, they printed the ship upside down. 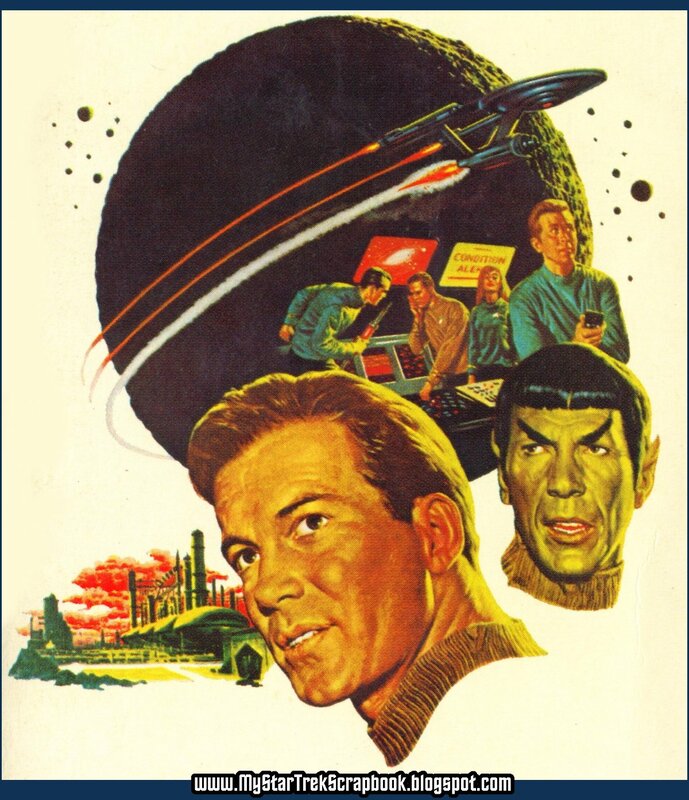 Even with Nimoy holding the model up. "Legs, boobies and basket weave present and accounted for, sir! "I refuse to look at the camera until Bill says I'm the star of the show." Relive the show in 3-D!